We’re glad you are interested in San Miguel High School. Our students are working for a brighter future, but they need your help! Our students get up before dawn every day to arrive to school on time and keep pace with a rigorous academic schedule. They earn 40% of the cost of their education by working in more than 100 businesses throughout Tucson. In addition, they pay a modest tuition of approximately $800 per year per student. Our students are, in fact, the largest benefactors to San Miguel High School. We ask you to match their energy, commitment and drive, by making a gift to our school. When you give, you are building the minds and changing the lives of our young men and women. They want to succeed, and with your help they will become young people of faith, purpose, and service. 100% of each of our graduating classes has been accepted to college. Our students attend schools across the country including: St. Mary's College of California, Georgetown University, the University of San Diego, Boston College, Northern Illinois University, University of Wisconsin-Madison, University of Arizona, Northern Arizona University, and College of the Holy Cross. As a result of a new and innovative curriculum, our freshmen students are able to grow on average one-and-a-half to two grade levels in math and English. Our students are doing needed entry-level work that is helping more than 100 of Tucson’s leading companies operate more effectively and efficiently. Thank you so much considering a gift to San Miguel High School. All gifts are greatly valued and appreciated at San Miguel —and you can give in a way that matters to you. There are many programs and causes to support at San Miguel, and no matter which you choose, please know that you are making a difference in the lives of our students. 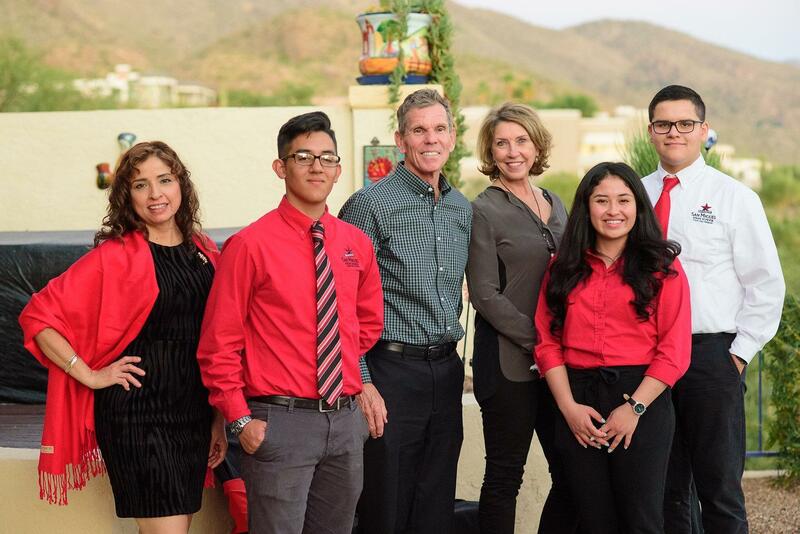 Please feel free to contact Paloma Lopez-Santiago, Vice President of Advancement, at santiagop@sanmiguelhigh.org or (520) 294-6403 x 1416 with any questions or for more information. San Miguel High School has 501C-3 status under the rules of the IRS. A donation to San Miguel High School can be tax deductible as a charitable contribution.